Britain is leading a group of European Union states who are trying to block an EU plan to include Saudi Arabia and 22 other jurisdictions on a blacklist of countries that pose money-laundering and terrorism financing threats, sources said. Swisscom, Sunrise and Salt have paid a relatively modest 380 million Swiss francs ($379 million) for fifth-generation wireless frequencies that will tighten their grip on the Swiss mobile market. The three were able to secure an attractively priced deal after a fourth company, London-based newcomer Dense Air, dropped out of the process, auction results showed on Friday. The outcome in Switzerland contrasts with neighboring Germany, where three big mobile operators face competition from a fourth operator in bidding for a slice of 5G spectrum. Princess Ubolratana Rajakanya Sirivadhana Barnavadi, 67, the elder sister of King Maha Vajiralongkorn, was nominated by a party loyal to ousted premier Thaksin Shinawatra, the figure at the center political turbulence and rival street protests that have riven Thai society for years. Islamic State is far from defeated, and instead is morphing into an asymmetrical warfare force after the militant group lost almost all of the territory it once controlled in Syria, German Chancellor Angela Merkel said on Friday. The European Pillar of Social Rights (EPSR) is a mainly symbolic instrument adopted by the Juncker commission in 2017. Yet, its choice of words suggests a closeness to national social rights—to institutions which not only guarantee legal certainty and obligation at the societal level but also promise a certain predictability for the subjects and addressees of these rights and the social policies linked to them. It is no secret that there is none of this at the supranational level of the EU and the EPSR does not change that. Such an apparent sham only adds to the impression that Social Europe is a ‘myth’, as Höpner put it. Another bit of basic economics that neoliberals hardly ever mention is the diminishing marginal utility of consumption. This implies quite the opposite of low tax rates at the top. It is socially much more beneficial to tax those to whom one dollar is not worth the effort of picking it off the sidewalk and transfer it to those who are poorer. 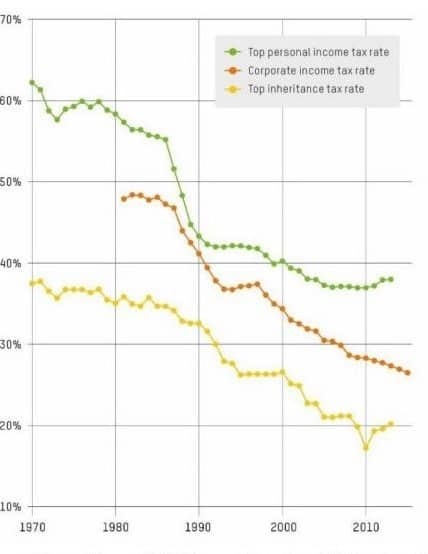 A well known paper by Diamond and Saez found that, after allowing for disincentive and avoidance effects, the optimal top rate of income tax in the US should be 73 per cent. There are two reasons why even 73 per cent might be an underestimate. But creating geopolitical stability internally has not, during the last two decades, been followed by external geopolitical stability along the fringes of the union. Most of the big EU member states (UK, Poland, Italy, Spain) participated, often eagerly, in Operation Iraqi Freedom, which led to the deaths of some half a million people, destabilized the middle east even further and produced Islamic State.